ting with the school this morning to allow the teachers, students and headmaster to gain a clear idea as to how their school could look. The meeting today went well and the model allowed us to take the School members through the materials to be used to construct a classroom and the overall size and space within the module. Through this discussion questions were raised over what materials should be used for each section. We discussed the different possibilities of using timber or steel to create the main classroom frame structure and were pleased to hear that the school were very happy and excited about the idea of a plastic fabric being used to create the roof. The current leaf and bamboo roofing systems only last one year and then need to be replaced so both the teachers and Headmaster could see the benefits of a fabric roof with a greater life span. We reviewed the idea of using half height wall sections between classrooms but it was decided that a full wall panel would be better suited to ensure students were focused on their teacher and the class being taught. However, it was agreed that a half height wall should be used at the end of the classroom to create light and a view out to the main courtyard. Discussing the design with the teachers was of great use and many interesting ideas came out of today’s meeting. Tha Taw one of the teachers at Kwe Ka Baung has taught at the school for 4 years. We asked Tha Taw what his idea of a good school design would be he is now going to set-up a class asking the school children to draw their ideal school design. I look forward to sharing their drawings and ideas with you soon. 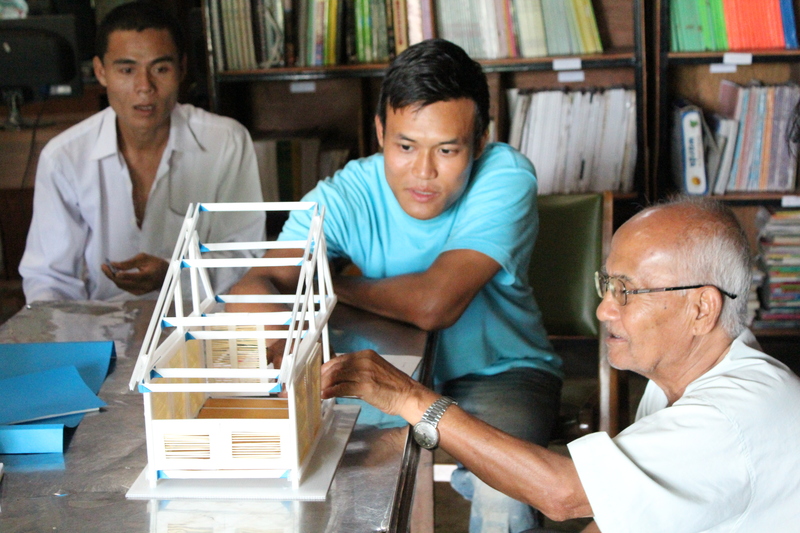 Still undecided on the main material to be used for the school design, we agreed with Mahn Bala Sein to visit both a timber yard and a steel supplier. We first visited a reclaimed timber yard where we were able to gain a better idea of costing of the material and also the size and lengths of material available in the area. We found out that the maximum length of timber was 4 metres and fresh timber is almost impossible to come by. 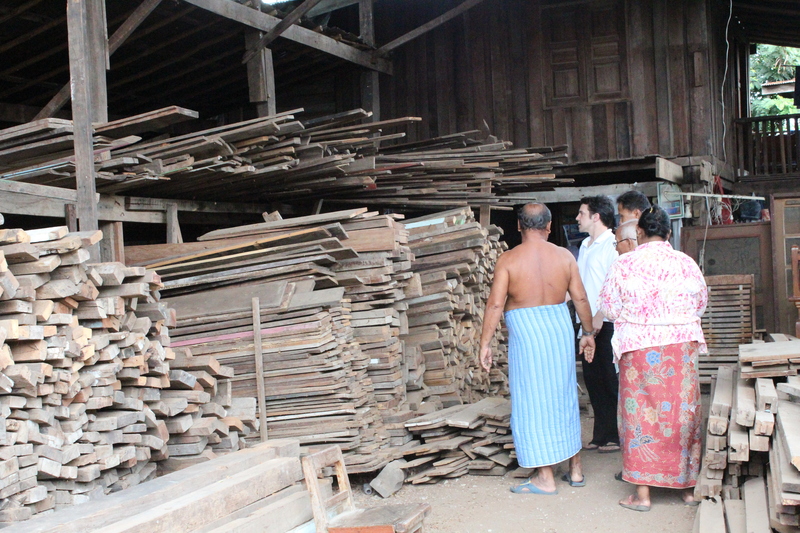 Meeting with timber yard in Mae Sot. After visiting the timber yard we visited a local steel supplier who showed us the lengths, dimensions, weights and variety of steel available and gave us an idea of costing based on our current design. This was very useful and we are now in a better position of understanding what we can achieve and what materials are available for us to use. After meeting with the school and the material suppliers today we had a great meeting with two Architects Albert from Spain and Jan from Germany who have both been working locally for the Mae Sot Clinic. They have been developing and designing further buildings for the Clinic from dormitories to toilets and also a brand new Training Centre. It was great to meet with them and discuss the ‘Moving Schools’ project and find out the best practises of working in the area. It felt very reassuring to know there were like minded individuals in the area who were willing to share their skills to develop some fantastic humanitarian projects. We thank them both for arranging to meet up and we hope we will be able to work out the finer details of the school construction with the help from their ‘insider’ knowledge. Well my Vodafone WOD placement may have ended but my volunteering for Building Trust International continues and things are busier than ever. 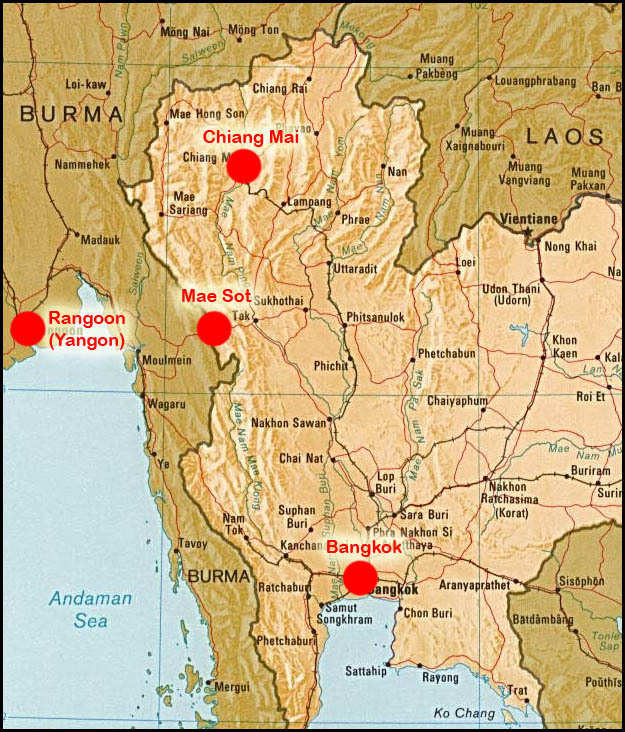 I have just arrived in Mae Sot, a small town on the Thai/Burmese border where I will be volunteering on the construction of the winning school design from our ‘School 4 Burma’ competition. The build is due to start in June with a team of Worldwide volunteers arriving to help with the project. Yesterday, we had a meeting with the school headmaster and discussed the potential sites for the school construction. We are awaiting final approval from the local community that we can start construction on the school this will be finalised in a meeting which will take place on June 6th. 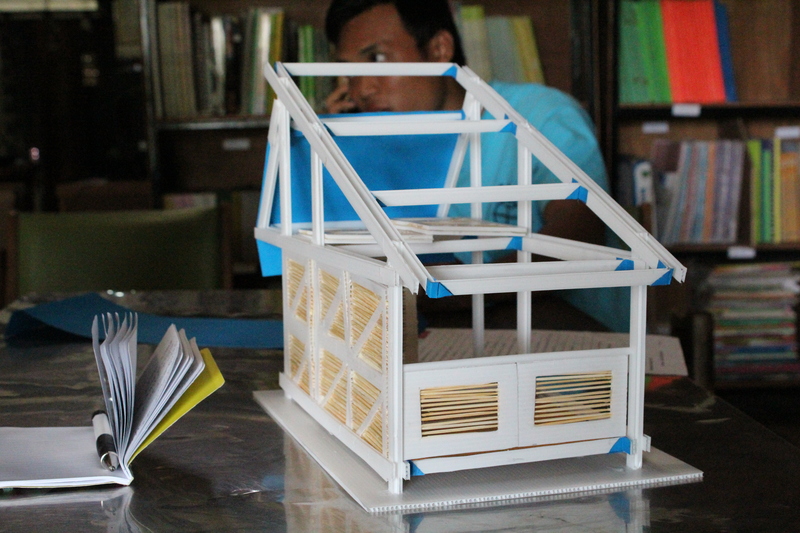 In the meantime, we are discussing with the school teachers to gain their thoughts and ideas on the winning design. We have also set-up meetings with local timber yards to discuss the costs of the materials to be used for the school construction. I look forward to sending through more details and photos as the build progresses. In the meantime, back in the UK Jude Sellen a Building Trust trustee is hosting a 2 month open house exhibition for the charity. Jude has arranged an open house showcasing the Moving Schools exhibition, which was recently on display in London. The event is open 10am to 5pm every weekend through May and June in the small town of Westmeston, outside of Brighton. Also on display in the house are photography works by local prize winning photographers. Many of the pieces on display have been kindly donated by the artists to raise further funding for the Moving Schools project. Along with fantastic pieces of art to purchase there is an garden cafe with baked goods, tasty cakes and even beans on toast on offer. With all proceeds going to the ‘Moving Schools’ project. Many thanks to Jude and the local community who have helped organise and plan such a fantastic event. 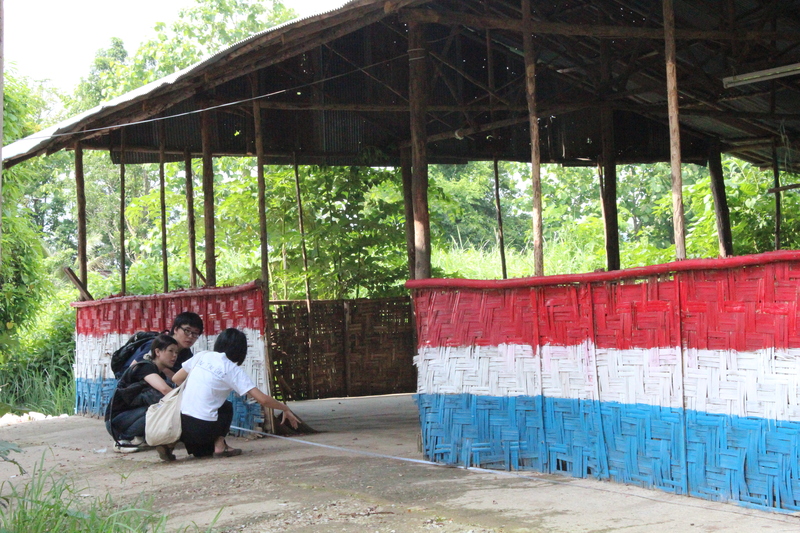 All funds raised will go directly into the ‘Moving Schools’ project which I am currently working on in Mae Sot. So please go and show your support.